A new free exhibition on political cartoons inspired by Shakespeare has opened in the Midlands with drawings that include Theresa May as Cleopatra and President Trump as Brutus. Draw New Mischief: 250 years of Shakespeare and Political Cartoons at the Royal Shakespeare Company(RSC) also features newly commissioned cartoons by some of the world's most famous newspaper political cartoonists including Steve Bell from The Guardian. The exhibition is open to view in the PACCAR Room, on Level Two of the Royal Shakespeare Theatre, in Stratford upon Avon, until September 15 to coincide with the RSC's politically-charged Rome season. There are new commissions by five famed cartoonists - award-winning Steve Bell, one of the Guardian's chief cartoonists; Daily Telegraph political cartoonist Christian Adams; Pulitzer Prize-winning Washington Post cartoonist Ann Telnaes; Lorna Miller, whose work appears in Private Eye; and Victor Ndula, a political cartoonist for Kenyan national newspaper The Star who won first prize in the United Nations/Ranan Lurie Political Cartoon Awards. Brexit is part of the political cartoons exhibition. 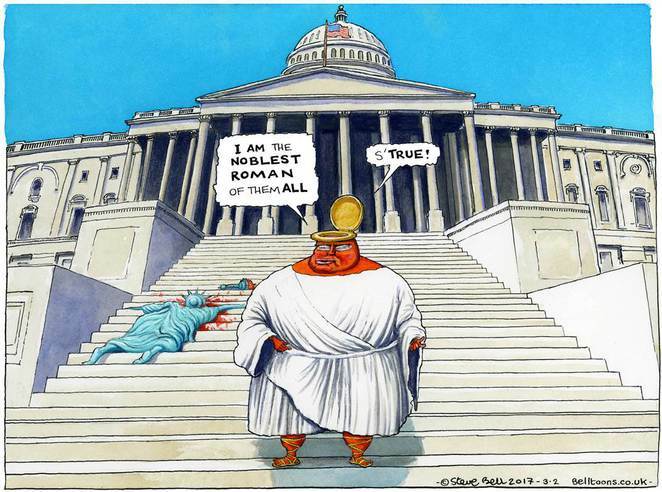 Each artist created a cartoon commenting on current politics through the lens of the four Roman Plays - Julius Caesar, Antony and Cleopatra, Titus Andronicus and Coriolanus. Among them is a drawing of Trump as Brutus with a dead Statue of Liberty lying slain on the floor of the steps of Capitol Hill in Washington DC. In addition to the recent cartoons, visitors can also view historical works from important political moments. These include the 1846 cartoon 'The Fall of Caesar' showing Prime Minister Robert Peel, who had just been forced to resign, as Caesar being murdered by his former allies. Other exhibits are Peter Schrank's 2015 depiction of Ed Miliband and Nicola Sturgeon as the star crossed lovers Romeo and Juliet and Morten Morland's cartoon of David Cameron as Hamlet gazing at Boris Johnson's skull from April 2016. There is also another Hamlet inspired cartoon featuring former American President Obama. The exhibition is in a small room that has framed cartoons around the walls and also original historic newspapers in the centre that featured a cartoon within the story. An RSC spokesman said: "Shakespeare's plays, both plots and characters, have been a touchstone for cartoonists who have drawn upon them to comment upon the political events and personalities of their time. "The plays' seemingly inexhaustible capacity to reflect human behaviour continues to provide cartoonists with a ready stock of rich imagery that resonates with the reading public." The Royal Shakespeare Theatre's Rome season includes Shakespeare's most political and bloody plays, set in and around ancient Rome. Beginning with Julius Caesar, the season also includes Antony & Cleopatra, Titus Andronicus and Coriolanus this year. The exhibition is curated in partnership with David Francis Taylor, Associate Professor of English at the University of Warwick.